Dionysius Exiguus invented the Anno Domini era to calculate the Easter date. 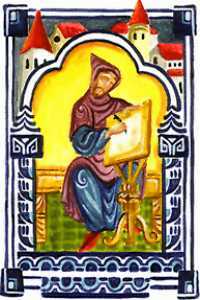 Computus (Latin for "computation") is the method for calculating the date of Easter. In the early 4th century there was confusion about when Christian Easter or the Resurrection should be celebrated. At the Arles Council, in 314, was obliged to all the Christianity to celebrate Easter the same day, and that this date was going to be assigned by the Pope, that was going to send epistles to all the churches in the world with the necessary instructions. However, not all the congregations followed those precepts. In the First Council of Nicaea, in 325, this subject was solved. Easter had to be celebrated on Sunday. It can not coincide with the Jewish festival of Passover, celebrated independently which day of the week it was. Christians cannot celebrate Easter twice the same year. This is explained because the new year started in the spring equinox, so the celebration of Easter before the real equinox was prohibited. However, there still were discussions between the Roman Church and the Alexandrian Church, while the Nicaea Council said that the Alexandria Church was right, they had to calculate the date (in Alexandria), then communicate it to Rome. The Roman Church had to spread the computus to the rest of the Christianity. Let's define 5 variables, a, b, c, d, and e. In addition to two constants, M and N, so the years between 1900 and 2100 take the values 24 and 5, respectively. We'll call A the year that we want to calculate the Easter date. e is the remainder of the division . If d + e < 10, the Easter date will be in March (d + e + 22). If opposed (d + e > 9), will be in April (d + e − 9). If the obtained date is April 26, the Easter date will be April 19, not April 26. If the obtained date is April 25, with d = 28, e = 6 and a > 10, then the Easter date will be April 18. A table from Sweden to compute the date of Easter 1140–1671 according to the Julian calendar. Notice the runic writing. Computus Facts for Kids. Kiddle Encyclopedia.